Not to be confused with the clankingly atmospheric 2012 documentary about trawler-fishing, this Leviathan is something like a retelling of the story of Job – a man who has the lot being tested in his faith as he loses it all. As we open, Kolya has a beautiful wife, a lovely beachside property, a teenage son and is respected in his community. Over the next two and half hours we watch most of it being stripped from him – in fact as Andrey Zvyagintsev opens his film there’s already trouble hemming Kolya in on most sides. The question is: which faith is it testing? The answer seems to be his belief in President Putin’s Russia, increasingly a mini-me version of the Soviet Union. We see plenty of the workings of the legal system as Kolya tries to prevent the parcel of land he owns being compulsorily purchased by the local mayor. But we also see plenty of the workings of the local mayor (a brilliantly sleazy Roman Madyanov), a bullyboy gangster who drives around in a convoy of black 4x4s. Leviathan has been heaped with awards at festivals, but for my money his previous feature Elena worked better, having a touch of humour missing here and a central character (a former nurse who has clearly married an old rich man for money) who was both allegorical and entirely human. Here, the relentlessness of the vision of modern Russia – vodka-sodden, relying on tough old industry, sunless, bleak, corrupt, pitiless – recalls the British kitchen sinkers of the early 1960s, as does its story, about a man trying to escape his milieu but held back by his status and by those around him. This is Mike Leigh’s second entire departure from his usual territory – modern Britain – the last being the fabulously entertaining serio-comic caper Topsy-Turvy, about Victorian composing double-act Gilbert and Sullivan. But he’s gone back even further this time, to paint a portrait of JMW Turner (1775-1851), one of Britain’s true greats, the artist who signalled art’s shift from the portrayal of external reality to the representation of mood. Timothy Spall presents Turner as a bluff cove with little time for social nicety, an exterior erected to prevent his heart of gold from being tarnished by time-wasters, flatterers, bores, pedants, spongers and the usual pilot fish of success. And Leigh then plonks this rather gauche figure into a situation strongly reminiscent of The History of Mr Polly – Turner finds a woman of simple, good nature (Marion Bailey) who loves him for what he is, and he opens up like a flower. They are never married, and in the era this was a problem, but it doesn’t impact the film much, which cunningly ducks the issue for the most part. Leaving it as a series of observations of Turner as he goes about his business – how he (or his doting father) prepares his paints, how he meet prospective buyers, how he does research for the Fighting Temeraire picture by strapping himself to a ship’s mast in a storm, how he puts the finishing touches to a painting even as it’s hanging in a gallery ready for exhibition. Unusually, a film about the work, not the life, closer to Martin Provost’s 2008 biopic Séraphine than Vincente Minnelli’s Lust for Life. Refreshing, that, especially the way Leigh keeps reinforcing what he’s up to by regular juxtapositions of sublime art with mundane reality (Turner spitting on his canvas to gain an effect, or asking his housekeeper Dorothy Atkinson to get rid of some dead bluebottles). There’s a touch of panto about it all, as there was with Topsy-Turvy (and often is in Leigh’s work) but a lightness of touch which keeps the pathos at bay and Spall’s Turner this side of caricature. Since The Full Monty in 1997, the UK has churned out likeable feelgood comedies in which the benighted occupants of one blue-collar region or another would regain their self-worth by various means, often accompanied by a symbolic affirmation of a sort of personalised boutique socialism (see Saving Grace, Lucky Break, Calendar Girls, Greenfingers, On a Clear Day just for starters). So the heart sank a little when Pride fell onto the doorstep, the story of how a metropolitan group of gay and lesbian activists in 1984 reached out to miners during the yearlong strike in Thatcher’s Britain and forged some sort of uneasy alliance with them. Double sinking at the sight of the name Matthew Warchus, another theatre director, and so doubtless heading in the same direction as Stephen Daldry, who turned his back on the boards to direct Billy Elliott – self-worth, regional, socialism, affirmation… and dancing. All the elements are there in spades in Pride. But what I wasn’t expecting was such a sharp script, such likeable performances, and jokes, funny ones. The casting is very good too, with names like Paddy Considine, Imelda Staunton and Bill Nighy passing themselves off very nicely as members of the Welsh mining community opening their arms, with varying degrees of affection, to the ragtag group of screaming flamers who descend upon them offering money they’ve collected in London – one oppressed group to another. The arc is absolutely obvious – lessons learnt on both sides – and the film never sets up a conflict that can’t be solved with a snappy comeback, a cup of tea or a dance breakout (see Dominic West as the most flamboyant gay in the village and grin from ear to ear). It wears its politics, sexual and otherwise, lightly, as if it weren’t just mainlining The Full Monty, but also the Carry On tradition (Staunton’s bustling, matronly dispenser of beverages and wisdom could so easily have been played by Joan Sims in a different era). And a word about Ben Schnetzer as the activist-in-chief, name unknown to me, but who is in fact the star of the piece, a performance so right it could have come straight out of the 1980s, from militant trouser length, to agit-prop flounce and a fast mouth that’s given the film’s best lines. After December Boys, The Woman in Black and What If, among others, I have more or less lost any interest, if I ever had any, in seeing a film starring Daniel Radcliffe. But he’s got a lot of money and could probably finance his own movies (don’t, Daniel, don’t) so we’ll probably be seeing a lot more of him until he decides to give up. At least in Horns he’s in his comfort zone, since it’s a supernatural-flavoured lightly comedic film that’s more Joss Whedon than JK Rowling, with a plot about a guy accused of murdering his girlfriend who suddenly sprouts horns. Are these an indicator of his guilt? Not exactly. Instead they exert a devilish truth-telling effect on anyone he comes into contact with – the local doctor admits he wants to get off his face on oxycontin, his mother tells him she doesn’t want him to be her son any more, and so on. All slightly shocking and very amusing. Our hero decides that this bizarre development might help him get further in finding out who killed his girl (Juno Temple, in flashback, once again waving her breasts about in an “if you’ve got it, flaunt it” performance) than the police, who have already decided Dan is their man. At this point the whole thing morphs into a detective procedural, with Radcliffe as an unlikely though winning investigator. It’s directed by Alexandre Aja, who is closer to the pop cultural zip and wink of 2010’s Piranha 3D than the overt horror of 2003’s Switchblade Romance, but even he can’t stop the third act of reveals and explanations from bogging down into one damn thing after another. In total, though, it’s impressive how well the film plays both to and against the Potter aspect of the Radcliffe baggage, with a lot more wit than you might expect. After the slightly overcooked 2010 movie, The Tree – Magic Realism 101 – Julie Bertuccelli returns to familiar territory with a documentary covering similar thematic ground to her thoughtful 2003 drama Since Otar Left – ethnicity, identity, cultural assimilation and the effects on individuals of what future ethnographers might call “the great migration”, which is transforming Europe and the world right now. But with such a light touch that it’s perfectly possible to watch this film without any of the issues intruding. Because all we see is a Parisian reception class full of children of all sorts of ethnicities – Wolof, Ukrainian, Arabic, Susi, Portuguese, and that’s just the start of it. And coaxing them towards proficiency in French a barely seen teacher of heroic patience and immense pedagogical skill. To encourage them to talk, and therefore to learn, Brigitte Cervoni – to whom the film is dedicated – gets the kids to tell stories of life back home, how things are different in France, or the same. And interspersed with these glimpses of the class lessons we meet the parents, at a parent-teacher evening, almost all of them desperate for their kids to be up to speed in the language of this new country, to fit in. So much for communities keeping to themselves, you think, as you also wonder to what extent Bertuccelli’s editing is making a political point. A passing thought, because the kids are so engaging, so delightful, and often so sad – “Miss, he’s crying” is a refrain you will get used to hearing. This is a gorgeous and uplifting film, and Bertuccelli introduces us so stealthily to the kids that when they go in to an exam to see if their French is good enough for them to join the big school, you’re entirely rooting for them. And a few scenes later, as Mme Cervoni bids her class farewell, you, too, may well be the focus of the “Miss, he’s crying”. As Lady Gaga’s medley at this year’s Oscars shows, The Sound of Music endures. The film, too, does go on a bit, being an entire act too long, as the Nazis arrive and the Von Trapps and Maria flee. But there’s no doubting its iconic status. This and the previous year’s Mary Poppins cemented Julie Andrews’s image as being primness personified and must have harmed her career. It certainly defined it, and more – there’s only one Mary Poppins and there’s also only one Maria, no matter how many stage revivals there are, Andrews having stamped her mark right through both films. If most hit musicals boast one good tune (Chicago), and timeless classic musicals maybe three or four (Singin’ in the Rain), The Sound of Music has between six and eight numbers whose very titles will almost universally bring the songs flooding back (The Lonely Goatherd, Climb Every Mountain, Edelweiss, Do-Re-Mi, Favourite Things). The two-disc set contains a new documentary about Andrews returning to Salzburg, Austria, though the film itself looks very much like the restoration from five years ago – great detail, lively contrast but a touch too much red in Andrews’s blonde hair for some tastes. So if you’ve already got that one, you’ve got to work out whether that new doc, an hour long, is worth springing for one more time. A film about a CIA agent with the sort of dementia that’s liable to make him behave extremely erratically, starring Nicolas Cage as said man, directed and written by Paul (Taxi Driver) Schrader? This sounds like a recipe for brilliant, chaotic madness, and possibly a fine film too. Sadly, we’re not going to see that film, because the studio re-edited the entire thing, adding a rhythmic orchestral soundtrack to try and turn Dying of the Light into something more Bourne-like, destroying Schrader’s and Cage’s film in the process. Everyone involved had signed standard non-disparagement agreements which forced them to stay shtumm on the subject. 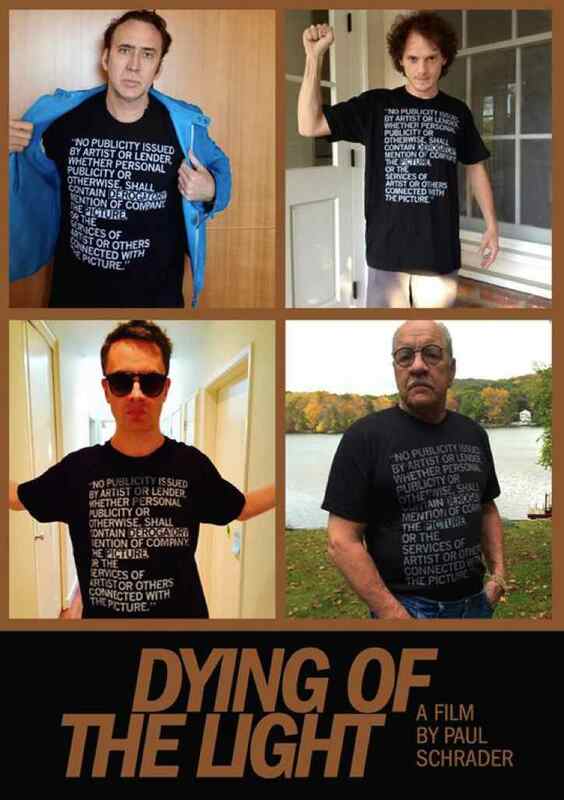 But Cage and Schrader, co-star Anton Yelchin and exec producer Nicolas Winding Refn, got around that by posing in T shirts expressing their disgust. Backstory over, is the film any good? In parts, though its plot – CIA guy with frontal temporal dementia goes in search of the crazed member of the Muslim Brotherhood who tortured him years before, only to find that he’s also mortally ill – invites easy metaphors. America is as sick as the people it’s chasing, and it has a nasty touch of amnesia too, and all that. And while it’s in this mode the film, shot largely in Romania, which has rarely looked so glam, is fascinating, intelligent and knotty, and justifies its looks and exotic cast (Irène Jacob, more at home in a film by Malle, Rivette, Antonioni or Kieslowski than a US spy caper). 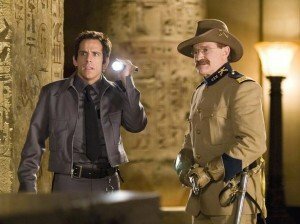 What the re-edit can’t hide is that it’s a very middle-aged film – Yelchin as Cage’s gopher notwithstanding – with themes that suggest Schrader is trying to address the boomer generation. How, 1960s people, did we let this last 20/30 years of constant warfare happen? How did we go from being the bright new hope to this interfering international bully? What happened? Well that’s what I think Schrader was going for, though you have to sieve the gloop to find the chunks in what is, as it stands, a fairly pointless film. As for whether the “original” would have been better, who knows?